Our bunnies stitch up quick in your hoop. They'll multiply like crazy. 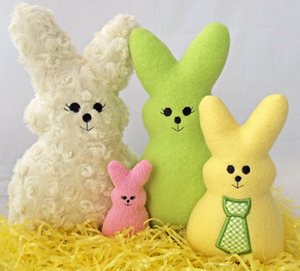 Our cute bunnies stitch up 'in your hoop' in just a couple of minutes. You can have a whole bunch in no time. Made of fleece, they're soft and snugly. 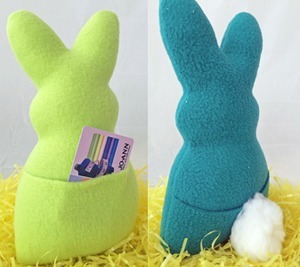 Perfect for Easter baskets & gifting. Boy bunnies in 3 sizes with applique ties are also in the set. Note, the 4x4 boy bunny has a filled embroidery tie as shown by the small orange bunny. All the bunnies have pockets on their back sides. Add a pompom for a tail, if desired. The bottoms end up being finished nicely. You don't have to whip stitch the opening closed if you don't want to. No unsightly hand sewing shows.